My little girl turns one this week. Wow... times goes by way too quickly!! I couldn't find a birthday shirt that I liked for her to wear on her birthday so I decided that I would make her one. For her party I decided to do something different than pink. I know... I am probably breaking the #1 rule of thumb with a little girl's first birthday party, but I did pink for my oldest girl's 1st birthday party and I wanted to mix it up a little the next time around. So I choose primary colors! 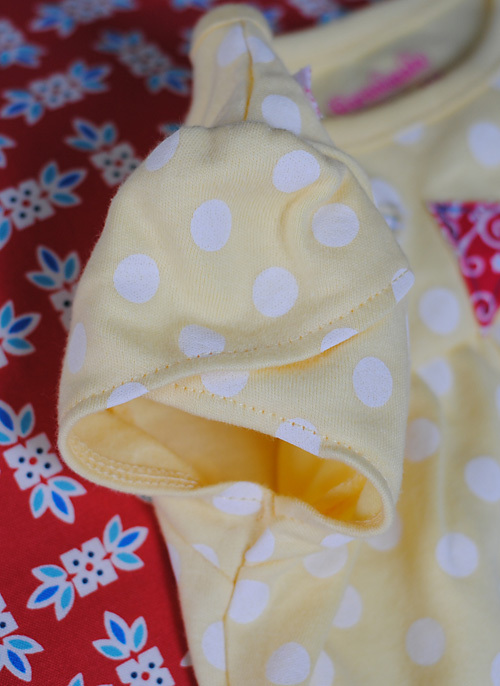 As I was walking through Walmart the other day my eye catch this darling yellow and white polka dot onsie. As I got closer I realized just how cute it was... It has tulip sleeves. DARLING. Plus it was $3.88. I mean- how can you go wrong there! So I bought one. Once I got home I came up with this idea... Not quite sure how I wanted to do it, but I got brainstorming and last night after the kiddos went to sleep I came up with this. To make it I used scraps of fabric leftover from previous projects and I ironed them to fusible interfacing (light/medium). Then I cut out a triangle pattern for the pendants of the banner and I got cutting. 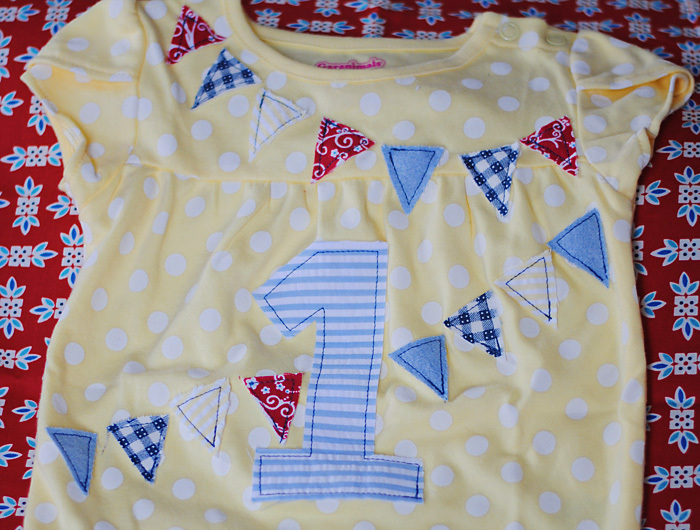 Once I had enough I decided that it would be a fun touch to have the #1 on the shirt so it looked more like a birthday shirt. So I got on the computer and found a font that I liked and typed the #1 and had it sized to be about 5x7 inches. Then I cut out some freezer paper (you can find it by the wax paper in the grocery store) to fit in my printer and printed the #1 on the freezer paper. Once it was printed I cut it out and ironed it (wax side down) to the fabric (with interfacing on it). Once the paper was fused to the fabric I carefully cut around the #1. After it was all cut out, I pulled the wax paper off. After you have all your fabric pieces cut out, you can arrange them onto your shirt and then start sewing them on. Easy Peasy! This is adorable! I love it and it's so much cuter than anything you could buy! It turned out so cute! Love the banner! I would love it if you would share this idea at my August "It's a Celebration" link party. I think my readers will love it as much as I do. Ummm..I love it. So cute ASH! You did it again girly. Can't wait to see what you make next! Really adorable! And I like that it is uniquely hers for her birthday. I came over from the Fabric Bows and More link party! I'm your newest follower! Very cute! I LOVE birthday shirts! Too adorable! 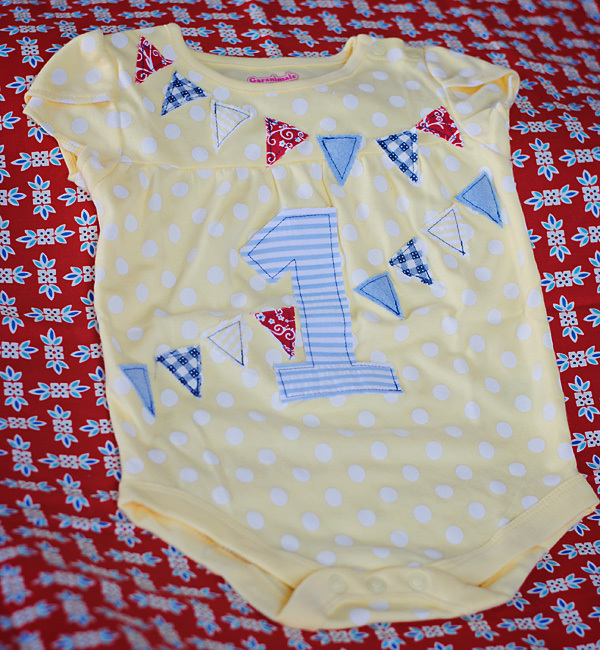 Love the little bunting that you added to this onsie. Happy early Birthday to your little one! Ash, this onesie is incredibly cute. I can't wait to see all you have in store for her little celebration. Happy Birthday Tay Tay!!!!!! I just wanted to say how cute this was! Thanks for visiting my blog and leaving a comment. It's beautiful!! My kid is already 18 months, but for the next I will take this on count!! 200 Followers Celebration & Giveaway!